For those of you who might be visiting this blog for the first time, welcome. I’m a unpaid blogger (read: not a professional writer) living in San Francisco. I am cofounder and CEO of Referly alongside my husband Kevin. I write about whatever interests me. Usual topics include marketing tactics, personal productivity, things I’m learning as a first time CEO. This year I published on my personal blog, the Twilio company blog, as a guest writer on TechCrunch Europe, and launched DistributionHacks.com where I focused exclusively on tactics for marketing and growth. I also took a very active role doing content marketing through the Referly company blog and on my Referly profile (I am counting collections as blog posts… I think we might be slowly be morphing into a blogging platform – more on that soon). 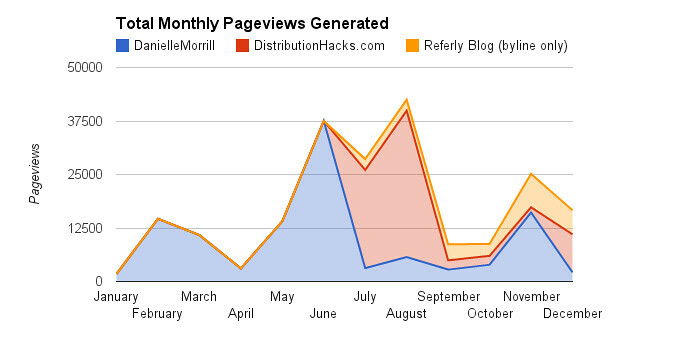 These ten posts generated 75% of my pageviews in 2012. The top 3 generated 37%. 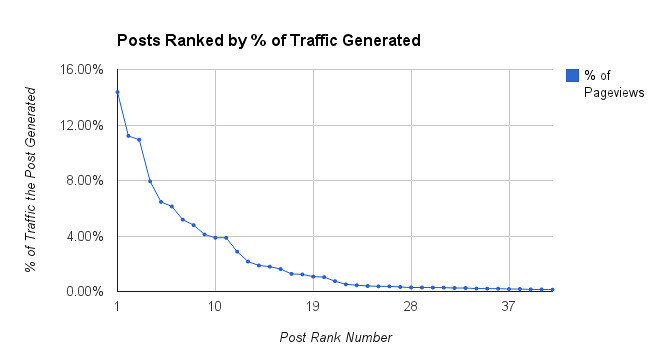 Here is the distribution curve for traffic. I know I’m not alone in my complaint that I wish tech publications covered a broader range of startups with interesting stories beyond funding and product launches. 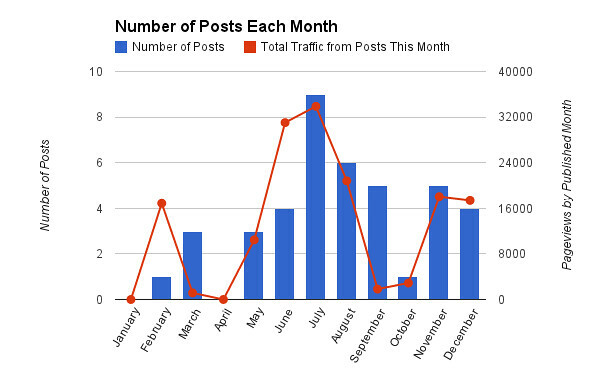 For those blogs it might not make sense, as long think or column pieces don’t always hit their mark and result in traffic. But since I don’t have to care much about traffic, I’m free to write whatever I want and take as long as I please. 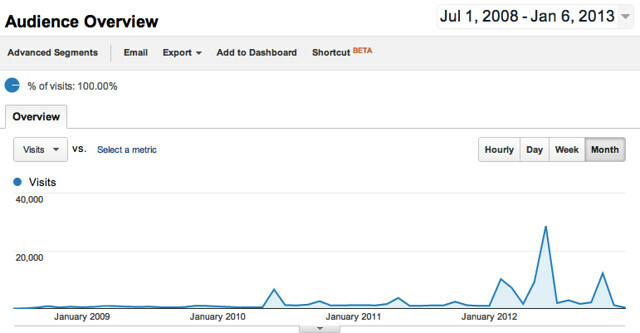 In 2012 I definitely published at least once a week on average, but my activity was spikey and inconsistent leaving readers wonder when the next piece would come out on Distribution Hacks for months (thanks for being patient with me). Accomplishing this goal might mean I actually need to make myself an editorial calendar, which I’ve been avoiding because it makes blogging feel like a job. But that might just be what it takes. I think it would be awesome to feature guest writers on Distribution Hacks, so I need to figure out how I want to approach people and get a bit more specific about the type of content the audience there expects. Guest posts are great because I can probably bring visibility to some awesome growth people who are just getting started with blogging. Are you one of them reading this? Contact me! One good habit I’ve developed with blogging is to write whenever an idea strikes, even if I’m not sure if/when/whether I’ll ever publish. Now I’ve got 216 stub posts in various stages of completeness on this blog alone, with plenty of Google docs and other notes that might be worth finishing.